Curlews are the most widespread of Bowland’s waders and can be found from the lowest wet pastures right up to the highest moorland tops. They prefer taller, open vegetation so hay meadows provide the ideal habitat. Curlews are our largest wader with a wingspan of over a metre and a long down-curved beak that it uses to probe deep into wet pastures for earthworms and invertebrate food also with brown upperparts and long legs. 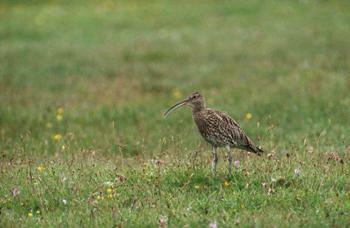 Few sounds are more characteristic of our uplands than the bubbling calls of the Curlew. This evocative song is delivered with a steep climb and parachuting descent on raised wings - a territorial display over the bird’s nesting territory.